Until recently, I had never heard of the Davis Mountains in Texas. A few years ago, when we passed through Fort Stockton on our way back west, I did read about them and thought, “Hmm, that sounds like a place we need to go.” But I forgot. What I did remember was that we really did want to get down to Big Bend NP, and what I learned is that Fort Davis and the Davis Mountains are considered part of the Big Bend, this lower southwest corner of Texas, bordered by the Big Bend of the Rio Grande River. In 2011, I read Nina’s horrifying account of the Fort Davis fires, where they were evacuated from the state park campground. In spite of the heat and drought and scary fire, she extolled the virtues of the state park and described how much they loved being there. Then later, as I was planning this trip, MBZ, (as she is known publicly in my blog comments) wrote a wonderfully detailed letter to me about ways to visit the area, what to see, what to avoid, and what not to miss. The Davis Mountains were high on her list. Thank you again, Mz MZB! When planning the trip, always in the back of my mind was the weather. One thing that is certain in the Big Bend area is that the weather is completely unpredictable. It can be 20 degrees, and rise to 80 degrees on the same day, It can be snowy and icy in January or warm and sunny. Makes it a bit difficult to plan. With this in mind, I made no reservations at Davis Mountains State Park for the two days we allowed ourselves. I didn’t want to stay longer, in spite of the glowing reviews, because…well…we only have three months and there is only so much time and Florida rivers are still a very long way from here. It was good that we weren’t tied in to reservations, since it let us stop spontaneously at Balmorhea SP the previous night. The two parks are only 34 miles apart, so the morning drive to Davis wasn’t a problem. Turns out we absolutely loved the Davis Mountains, and as we drove into the state park at 10 am, we were thrilled to find our campsite along the dry creek bed under scrub oak and juniper. The park staff didn’t blink an eye at the early arrival, and we even managed to save the $7.00 per person state park entry fee since we had paid just this morning for our single night at Balmorhea State Park. Nice. The Texas State Park pass is only $70., and covers one vehicle (including your toad) with up to 12 people. At Balmorhea we had to pay individually, so if you are going to be in Texas State Parks for more than 4 days, it is a deal. Next time we will definitely spend more than 4 days in the state parks. 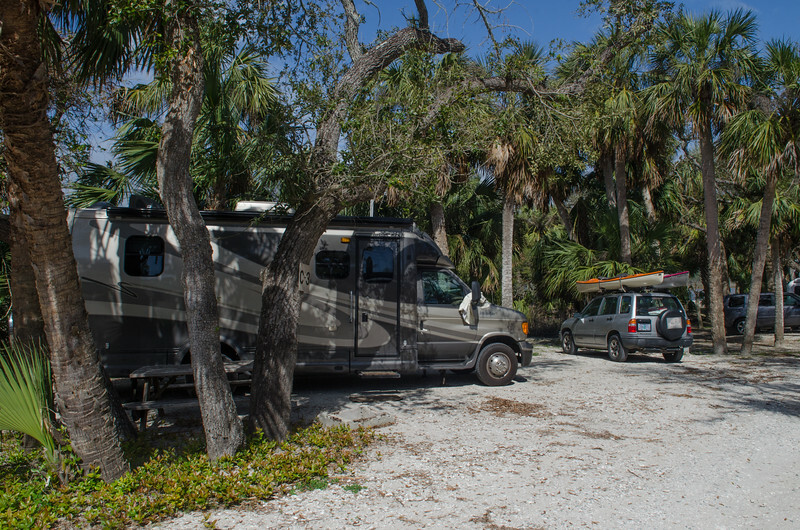 Texas state parks that we have enjoyed so far seem to be on a par with our wonderful Oregon state parks, just lovely with great amenities and roomy, spacious campsites. Once settled in, we had the rest of the day to explore some of the more celebrated areas of the Davis Mountains and of course one day wasn’t nearly enough. Three items are high on the list if you visit this area. Drive the Scenic Loop, just 75 miles through the mountains and back, visit McDonald Observatory, and check out the Historic Fort Davis site near the town of Fort Davis. We did all three, amazing to manage all that in a day, but worth every minute. The Scenic Loop meanders through the mountains, and passes the observatory just 17 miles up the hill from the campground. We had thought to drive the loop first and then I would go back to the observatory, but as we passed, it was just a few minutes before 11AM, and time for the sun telescope showing. Right now there are some huge sunspots creating auroras and flares and the skies were crystal clear. Mo said, “Go ahead”, and she dropped me off for the nearly 3 hour tour and drove back to the campground with Abby. The tour was incredible. There were only two other people on the tour, a young couple who were obviously into astronomy and very well educated. They really added a lot to the tour because they asked complex questions that the tour guide was more than happy to answer. I learned a lot that day about astronomy. Did you know that the moon as retreated five feet in the recent decades? That you don’t “look” through a telescope any more, that they basically gather photons and the information is processed by computer? I could go on and on with all sorts of amazing tidbits that I learned during that short tour. Seeing live images of the sun and watching the sunspots and the flares was amazing. Even more amazing was watching the huge telescope move and learning how it all worked together. Amazing time. When I got off the shuttle bus, Mo and Abby were waiting in the parking lot and we continued our Scenic Tour route in the afternoon. Surprisingly, we didn’t see a lot of evidence of the huge fire that burned through here in 2011. Locals said that the heavy rains back in 2012 contributed to the regeneration of thick grasses that hid a lot of the damage. Still, with drought a big issue again, the people in Fort Davis are nervous whenever there is a thunderstorm or the winds blow. Several homes were lost and it was a terrifying time for the people who lived here. I talked with a man working at the courthouse grounds the morning we left, and he said the biggest problem was that the fire had started in Marfa, the Fort Davis fire department went to help there, and then were cut off by the fire and couldn’t get back to Fort Davis when the fire raged through the town. Then the fire took out the transformer station and when they did finally get back they couldn’t get fuel or water because there was no power. He said everyone is still pretty skittish. Nice man, named Jim, with a sweet southern drawl and very friendly. We returned to the park, and then decided that there was enough time left in the day to go back and explore the Fort Davis Historic site. Ok. Not really enough time. We arrived at the visitor center at 4:45 and the park closed the gates at 5:00. Still, we got to see it at least. When the bugle sounded taps, we knew it was time to leave, and didn’t make it to the commissary or to the hospital. There are several buildings which have been restored, several which are furnished that you can tour, and many others that are still in unrestored condition. The grounds are beautiful though, and we will definitely go back someday to give the site the time it deserves. Back to the campground, we had time to drive the Skyline Road to an expansive view of the mountains and Fort Davis below. The road was steep and narrow with tight switchbacks, and when we gotback we will try out the trail that goes to the overlook from the campground information center. We then drove through the campground, up the hill another mile or so to the Indian Lodge. The lodge was built of adobe by the CCC in the 30’s and the lobby has been restored to its authentic character from that time. The rooms are not expensive, there is a nice restaurant, and the views of the valley below are wonderful. It was fun walking around and exploring a bit, enjoying the ambience of an old CCC lodge. If it sounds like we filled up a day with a lot of stuff, we certainly did. Like so many others have said, the Davis Mountains are a wonderful place to spend some quality time, with plenty to do and a wonderful state park campground to use as a base. Mo and I added this to the list of places we must return and spend a bit more time just enjoying and relaxing and seeing it in a bit more depth.